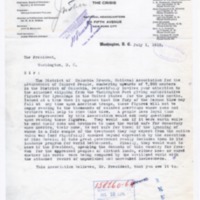 The District of Columbia Branch, National Association for the Advancement of Colored People, numbering upwards of 7,000 members in the District of Columbia, respectfully invites your attention to the attached clipping from the Washington Post giving authoritative figures for lynchings in the United States for the past six months. Issued at a time when it appears that the fury of the German blow may fall at any time upon American troops, these figures will not be happy reading to the thousands of colored Americans whose sons and brothers will help to stem this blow. A people less loyal than those represented by this Association would ask many question upon reading these figures. They would ask if it were worth while to send their sons and brothers to make the world safe for democracy when America, their home, is not safe for them; if the lynching of women is a fair sample of the treatment they may expect from the nation which was (and rightfully) shocked beyond expression by the execution of Miss Cavell; if this great government really includes them in its laudable program for world betterment. Finally, they would want to know if the President, speaking the demands of this country for freedom for the oppressed people of distant lands, either knew or cared whether his words were being compared by the civilized world with the attached record of unpunished and unrebuked lawlessness. This Association believes, Mr. President, that you owe it to yourself to express your disapprobation of the lynching of colored men and women. We gather from the press that you are to deliver a speech on the 4th of July. May we suggest that this would be a fitting time to include in your remarks some assurance of your belief that the lynching of colored people should no longer be tolerated in this country. Grimké, Archibald Henry, 1849-1930, “Archibald H. Grimke to Wilson,” 1918 July 1, TI00252, Race and Segregation Collection, Woodrow Wilson Presidential Library & Museum, Staunton, Virginia.